The Alley Cats are the greatest bowling team in the world, genetically modified felines optimized to play ten-pin bowling. Click here to play! Back when they were first revealed to the world, the Alley Cats dominated the professional bowling circuits. There was a backlash, however, and now they are relegated to the streets, having to play ten-pin in back lots and alleyways for scraps. Right now, the Alley Cats from all over the city are organizing a street bowling tournament. They've got the catnip ready, they've scoured the streets and garbage cans for food, and they've pieced together a trophy from junk. While the official bowling organizations don't recognize it, the human bowling pros have been entering it as well, looking to prove their talents against the best ten-pin playing cats in the world. It's going to be a surreal tournament, but that's just what the modern game of ten-pin bowling has become. 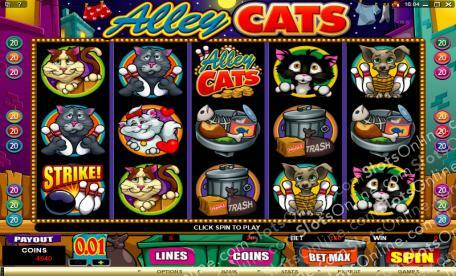 If you thing you're lucky enough to beat the Alley Cats at their own game, then check out the Alley Cats slots. These cats are the best bowlers in a world that refuses to acknowledge their existence. If you can wrest the championship trophy from their paws fair and square, there'll be no human player who can stop you. The tournament starts soon, so you'd better get in on the game right away. Strike! Symbols are scatter symbols that payout on the total bet when 3 or more are onscreen. 3 symbols pay 2 times the bet, 4 symbols pay 10 times the bet, and 5 symbols pay 100 times the bet. Alley Cats and Bowling Cat symbols act somewhat like wild symbols in that combinations of the two can make up winning paylines. They do not substitute for other symbols, however. 3 or more scatter symbols left to right trigger the bonus feature or 20 free spins. In the bonus game, you select objects to bowl a ball at. Each object has its own prize amount and you receive a number of balls according to the number of scatter symbols that triggered the bonus round.